Some companies like to make a show of their appearances at big tech conferences like IFA. Some of them just like to announce everything all at once, and Lenovo is squarely in the latter category. The company's only Android addition in Berlin is the Tab S8, but thanks to an interesting collection of specs and price tag, it's worth your attention. The 8-inch tablet is a decent mid-range device on paper, but the interesting part is that Lenovo has set the suggested retail price at $199. 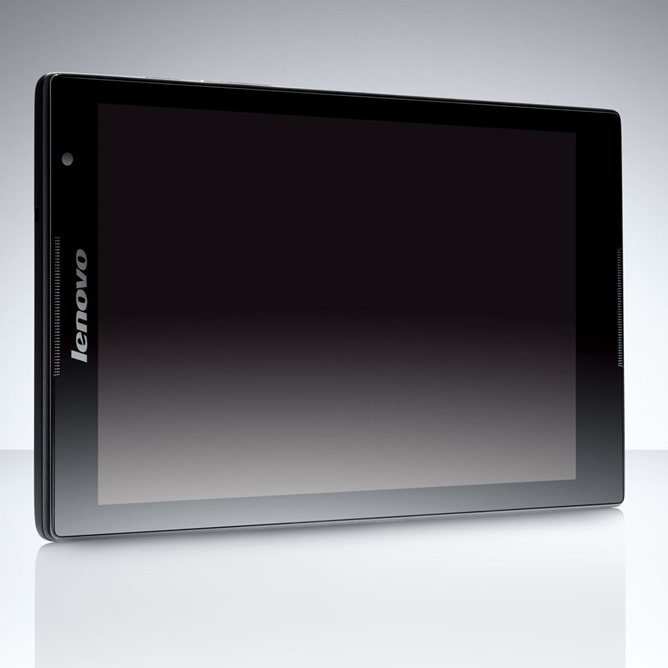 As you might guess, the Tab 8 uses an 8-inch screen. This will be a full 1920x1200 16:10 IPS panel - not bad, not bad at all. Lenovo has opted for an Intel SoC, specifically the quad-core Z3745, which tops out at 1.86Ghz, paired to a respectable 2GB of RAM. The base model will include 16GB of storage, which is standard but disappointing, given the lack of a MicroSD card slot. [Update: We've been informed that the Tab S8 does have a MicroSD card slot, despite the omission from the initial tech specifications.] The front panel holds two stereo speakers and a 1.6MP camera, and around back you'll find an 8 megapixel camera with an F2.2 lens. The tablet uses Android 4.4, almost certainly with the manufacturer's skin on top. Bezels are in line with similar models, though the body is notably thin at 7.9mm. Lenovo says it will start selling the Tab S8 later this month at major retailers. The low price is impressive considering its capabilities, and might be worth a look for anyone wanting a mid-sized tablet on a budget. Colors will be black, white, blue, and yellow, though you may not see them all in every location. 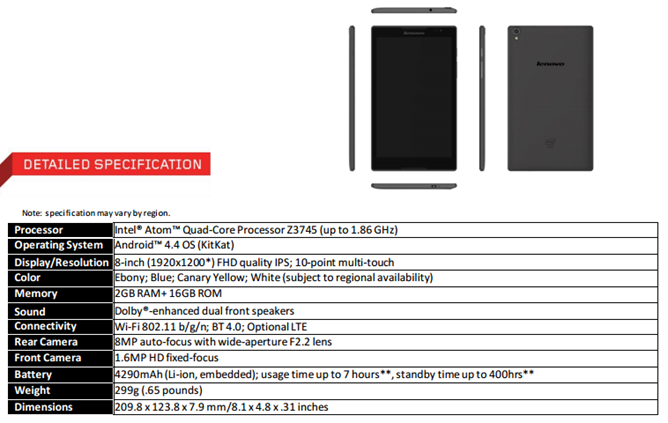 The spec sheet and press release also mention a 3G/LTE version of the Tab S8, but I doubt that will be widely distributed in the American market - Lenovo doesn't have strong ties to any US carriers. BERLIN, GERMANY – September 3, 2014: Lenovo (HKSE: 992) (ADR: LNVGY) today announced at the 2014 IFA Consumer Electronics Unlimited show in Berlin an expanded portfolio of tablets and PCs that gives consumers more options for tablets that fit their mobile lifestyle as well as choices of dedicated gaming PCs. The new lineup kicks off with the TAB S8, Lenovo’s first Intel-powered Android tablet. Lenovo also announced two new high-performance gaming PCs: the Y70 Touch, Lenovo’s first 17-inch touch laptop with the latest processor and graphics technology for HD gaming, and the ERAZER X315, Lenovo’s latest affordable desktop gaming PCs. Lenovo created the TAB S8 for consumers who are looking for a stylish, slim and affordable Android tablet starting at just $199. At 8-inches, the TAB S8’s 1920x1200 infinity screen is sharper than FHD, while the One Glass Solution touch-panel technology provides a crystal clear viewing experience. The tablet’s ultra-slim bezel seamlessly merges the screen with the dark front panel, giving the TAB S8 a sleek, clean look. The front panel also features a 1.6-megapixel HD camera for easy video chatting. Turn the TAB S8 around to reveal an 8-megapixel rear-facing camera. The wide aperture f2.2 lens snaps sharp photos, even in low light. Pre-installed apps, like SHAREit, allow for easy and safe photo and file sharing. Engineered to give users the most from their mobile device without sacrificing portability, the Lenovo TAB S8 marks Lenovo’s first 8-inch Android tablet powered by an Intel processor. Available with the Intel Atom Z3745 Processor with Intel® Burst Performance Technology, the TAB S8 dynamically matches processing power to the task at hand in order to maximize battery life without compromising speed in a thin and light design. The TAB S8 is just 0.65 pounds and 0.31 inches thin, nearly as thin as a standard pencil. Additional features include optional high-speed LTE (4G) connectivity (based on Intel® XMMTM 7160) and Wi-Fi for data connectivity, up to seven hours of battery life to keep users cord-free, and 64-bit technology compatibility. The TAB S8 runs Android 4.4 KitKat, includes 2GB of RAM, 16GB of storage, Bluetooth 4.0 and Dolby®-enhanced dual front speakers. The Lenovo Y70 Touch comes with an up to 4th generation Intel® Core™ i7 processor and powerful NVIDIA GTX graphics, making it ideal for heavy entertainment use and HD gaming. At 17 inches, the Y70 Touch is Lenovo’s largest touchscreen laptop, opening up a whole new level of interaction for video editing, social sharing and gaming. The Y70 delivers a fantastic audio and visual experience, with a FHD display that brings movies and games to life with enhanced color, clarity and resolution. Its JBL®-designed stereo speakers and subwoofer paired with Dolby® Advanced Audio provide a totally immersive audio experience rarely found on a laptop. The backlit keyboard glows in dimly lit environments, adding to the overall visual experience. At under 7.5 pounds, the Y70 Touch is thinner and lighter than most other laptops in its class thanks to the included external optical disc drive that supports both DVD and Blu-ray. The Y70 Touch also features up to five hours of battery life and customizable memory and storage options, with up to 16GB DDR3L and 1TB of SSHD storage or 256GB SSD storage. The Lenovo ERAZER X315 is the latest addition to Lenovo’s line of affordable gaming desktop PCs. To keep users in the action, the ERAZER X315 features AMD Radeon™ R9 series graphics, a quad-core processor and up to 2TB of SSHD. The combined power and speed allows users to play the most intense games seamlessly without lag. The ERAZER X315 boosts the gaming experience with immersive audio featuring 7.1 channel sound support and Dolby® enhancements. Other features include up to 12GB of memory, four USB 3.0 ports and always-on USB charging port for enhanced connectivity. The Lenovo TAB S8 will be available beginning in September with models starting at $199 via major retailers and www.lenovo.com. The Lenovo Y70 Touch will be available beginning in October 2014 with models starting at $1,299 via major retailers and www.lenovo.com. 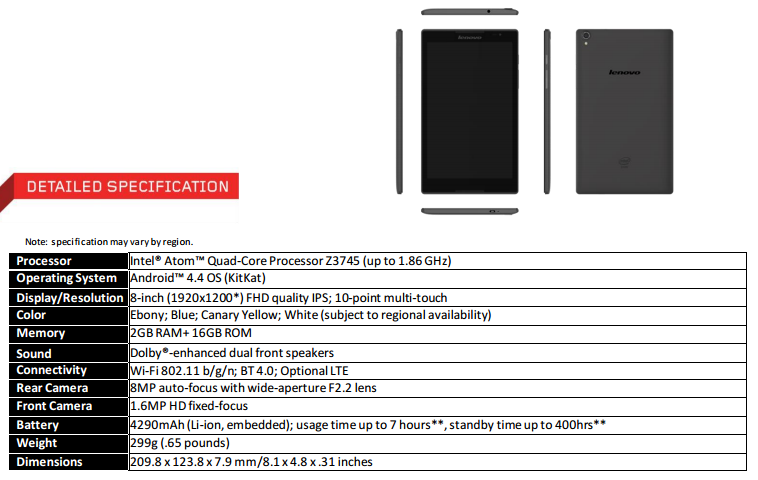 The Lenovo ERAZER X315 will be available in North America beginning in November 2014 with models starting at $599 via major retailers and www.lenovo.com.